Grande Vegas Casino was Established in 2009 and has quickly built an excellent reputation within the industry and today boasts a large community of loyal members. 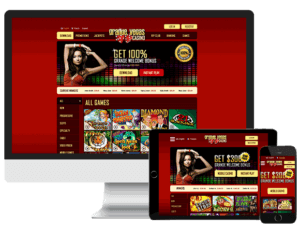 The bright and clean design of the casino website comes with a user-friendly interface which allows quick and easy access to all areas of interest. The casino provides close to 200 exciting games, including pokies, table games, specialties and video poker. Grande Vegas Live Casino enables you to play your favourite table games while facing live dealers. Players can rest assured of a safe gaming experience as this casino in licensed by the British Virgin Islands. 1st Deposit: If you are a new player and use bonus code 100MATCH when making your first deposit, the casino will reward you with a 100% match up to AU$100. 2nd Deposit: Grande Vegas Casino offers 150% Bonus up to AU$150 plus 50 Free Spins on Achilles. Just remember to use code 150MATCH. 3rd Deposit: When players make a third deposit they can use the coupon code 50FREE and let you collect AU$50 Free Bonus. Deposit plus bonus amount needs to be wagered 30 times before making a withdrawal. Apart from Pokies, Bonus Bingo, European Slot Poker and Scratch Cards will also contribute to your wagering requirements. When using no deposit coupons, you’ll have to play through the bonus amount 60 times and same applies to Free Spins claimed. Free Grande Monday rewards gamers who have deposited and wagered on weekends, Friday to Sunday. A good no-deposit Raffle bonus worth up to $250 could be yours, so make sure to check your Inbox on Monday, you might be one of the lucky winners. Deposit and play throughout Mondays and Tuesdays to win a no-deposit mystery bonus worth up to $250. The weekly draw takes place every Wednesday. You can also enjoy the casino’s 25% cashback promotion which comes with 10x play-through requirement and no maximum payout. Provided your balance is between 0 and AU$5, you can claim 25% cash back on every deposit you make. The maximum cashback amount is AU$300. Pokies Tournaments offer a new kind of gaming experience. You’ll get to enjoy the thrill of the competition by playing pokies against other players. If you end up among those with the highest number of points, you’ll get a prize with monetary value. As soon as you register with Grande Vegas Casino, you’ll start collecting comp points. Grande Vegas rewards your loyalty by awarding one comp point for every AU$10 wagered. Once you accumulate 100 points, you’ll be able to redeem them for cash. Stay on the lookout for Game of the Month; it will allow you to double your comps while wagering only AU$5. Grande Vegas Casino strives to provide the best 24/7 customer service and offers numerous options to contact the casino directly. You can talk to their support staff using an Australian toll-free phone number, send them an email or chat live using Skype. Grande Vegas Casino is powered by Real Time Gaming, a trusted software provider. Games can be accessed through a downloadable casino client or played instantly in your browser. The download version will enable you to access all of the games in the library and benefit from the most enjoyable gaming experience. It will also give you a chance to take part in the exciting Slot Tournaments! Download and registration process is quick and straightforward, so you should be playing your favourite online casino games in a matter of minutes. Some fast and reliable options are available for making your deposits and withdrawals. These include Visa and MasterCard, Neteller, EcoCard, Paysafecard, MoneyBookers and Wire Transfer. The maximum payout per customer is AU$10,000 per week and, depending on the method chosen, you can collect your winnings in as little as 24 hours. Grande Vegas is licensed in Curacao and CDS certified. It uses industry-standard encryption technology which makes sure all your personal information is kept safe. Additionally, RTG software and games are regularly tested and approved by TST Labs, an international leader in software testing which imposes strict regulatory standards to apply certification. All of the above ensures you’ll be playing in a safe and secure environment. Grande Vegas Casino has a wide selection of online pokies including 3-reel, 5-reel, and 6-reel pokies, as well as six progressive games. The Big Bopper is one of the 6-reel online pokies on offer, paying tribute to rock & roll star famous for his 1958 recording of “Chantilly Lace” and awarding many free spins, multipliers, and instant wins. If you’re looking to land life-changing wins, spin the reels of Aztec’s Millions which currently stands at about AU$2 million or Megasaur with a jackpot value of AU$1 million and counting. Poker fans get to choose among Caribbean Draw, Caribbean Stud, and Caribbean Hold’Em, as well as Pai Gow and Tri Card Poker. Baccarat, Rummy, and War are some of the other card games available. A collection of table games also includes French, European, American and Multiplayer Roulette, Craps and Sic Bo. Video Poker fans can choose between various 1- hand, 3-hand, 10-hand, 52-hand and 100 hands options to play Aces & Eights, Bonus Deuces Wild, Jacks or Better, Loose Deuces and quite a few more. Grande Vegas Live Casino is the perfect option for players looking to get as close as possible to land-based casino experience. You can join live dealers for a game of Blackjack, Baccarat, European and American Roulette or try your luck at a live Casino Hold’Em table. Grande Vegas Casino has a user-friendly mobile site can be easily accessed using an iOS or Android mobile device. As when playing on the desktop, the site is easy to navigate and will allow access to about 60 casino games. The game library includes both the classic RTG pokies as well as new releases, several Poker and Blackjack variants, European Roulette and Keno. You will also be able to deposit and withdraw funds and benefit from the Casino’s rich promotional library. Grande Vegas Casino is a great option for Aussie gamers looking for top-notch games selection, attractive promotional offers, convenient and safe banking methods. The casino provides the best RTG has to offer, ensuring you can enjoy their classic slots as well as those recently released, all of the popular table games and Video Pokers as well as taste some live action. Whether you choose to download Casino software or play in your browser and access the games via your desktop or mobile device, you’ll enjoy the same high-quality gaming experience. The casino’s generous welcome offer is just the tip of the iceberg, with many more promotions continuously awarding deposit bonuses, free spins, and cash awards. Should you get stuck, support is available 24/7 and includes a toll-free phone number you can call to receive instant help. Whether you are a passionate Australian gaming veteran or just taking your first steps in the online casino world, Grande Vegas will efficiently cater to your needs. For these reasons, we have decided to give this casino a rating of 4/5 stars.